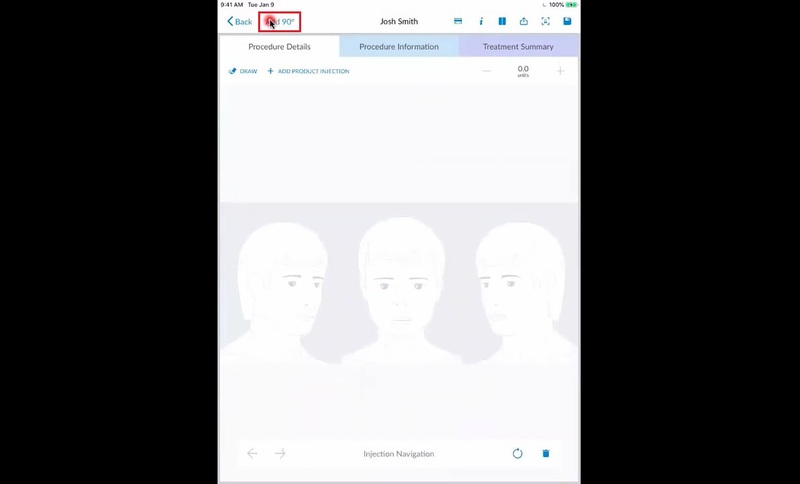 Add a new procedure using the app! 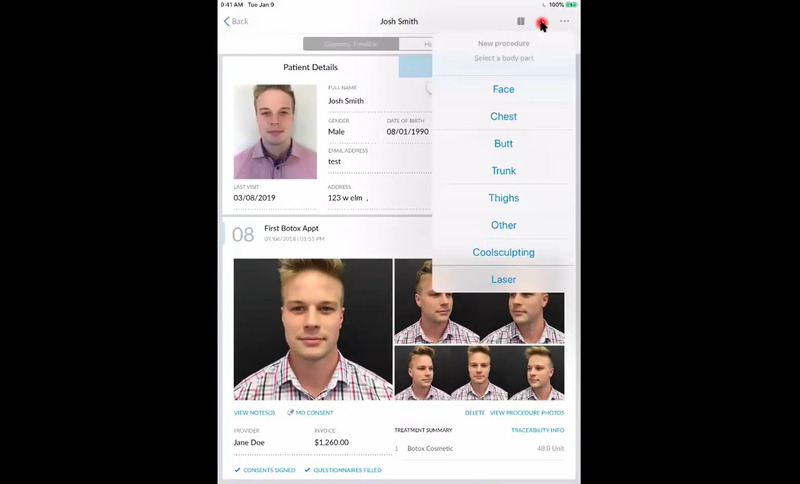 Adding a new procedure is easy with the Aesthetic Record app on your mobile device. 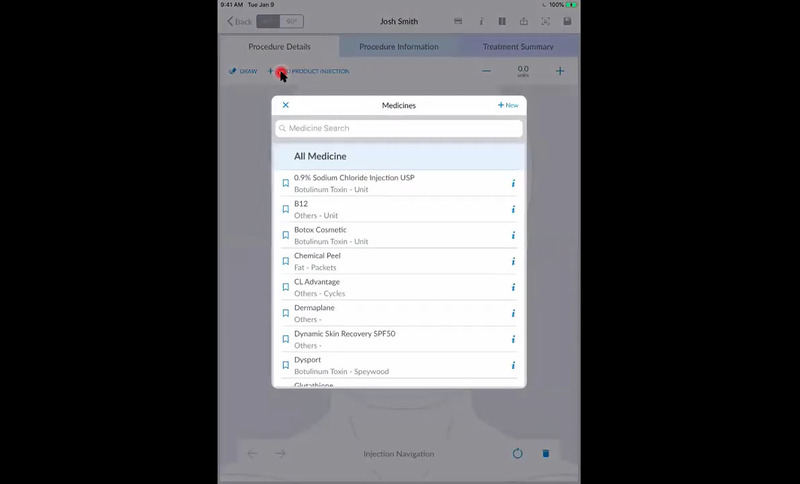 The app is designed to automatically pull all relevant information from your appointment and inventory settings to populate various forms and options, meaning you won't have to go back and forth to fetch the necessary data for your procedure. Note: You have to set up your product inventory and pricing in the inventory settings before adding a new procedure to your client profile. If you haven't done so, please learn how do do it here. Before you go on, please watch the video below, it's an overview of the entire procedure creation process. 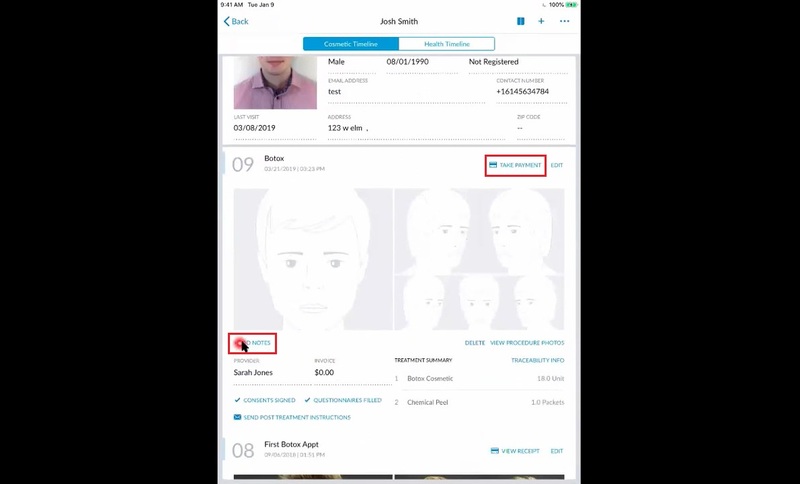 To add a new procedure to your client profile, first, you need to log in the Aesthetic Record app with your credentials. From the main menu, select Patient List and choose the appropriate patient. The client profile will pop up and you will see their Cosmetic Timeline, where all of their procedures are listed. In the top right corner, tap on the + icon to add a new procedure. Choose a body part from the drop-down menu where you will be taking procedure photos to proceed. You will arrive at the new procedure creation window. You will be entering all relevant procedure information here. The Provider Name and Clinic Name are filled automatically. If you need to change anything, tap on the drop-down menus and make your edit accordingly. Under Appointment Information, click on Appointment Time to select the appointment associated with this new procedure. If the client hasn't booked an appointment, you won't be able to select anything here. You can still proceed with the procedure without an appointment booked through Aesthetic Record. Under Procedure Description, fill out the Procedure Name and Procedure Date. At the bottom of the screen, once you have selected an appointment, you will see the client's medical questionnaire and signed consent here. If the questionnaire or consent are not filled, that means the client has not answered and signed them on the Patient Portal prior to their visit. Tap on Add Medical Questionnaire, select the appropriate questionnaire and go through the questionnaire with your patient. 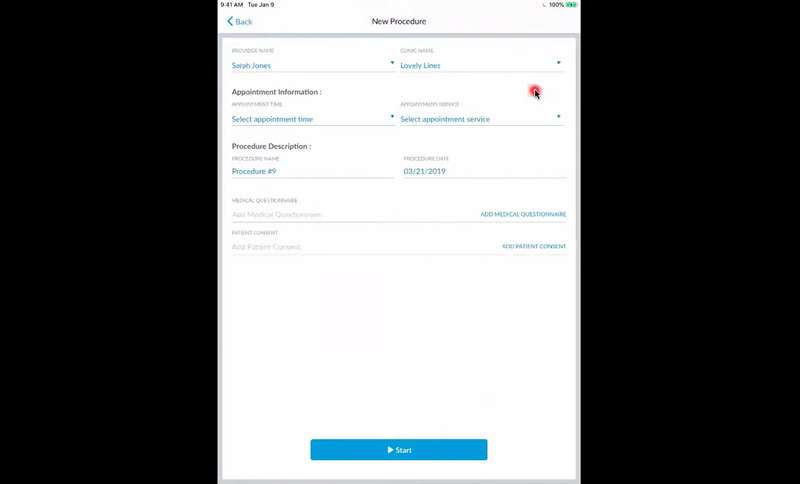 If you want your client to do the questionnaire by themselves, while you're on the questionnaire window, tap on the lock icon to lock down your iPad and hand it over to your client. This feature is especially important for HIPAA compliance. Once the questionnaire has been answered, tap Save. Do the same for the patient consent section if you need to. Tap on Add Patient Consent and select Sign and Accept when the form pops up, then let your patient sign the consent and tap Save afterward. Back at the procedure creation window, tap Start at the bottom of the screen to start taking procedure photos. On the new window, you will see the image template for the front and side views of your client's body part. Tap on Take a Photo to take live photos and follow to prompt to proceed with your procedure. If your client doesn't want to take photos, you can use the template images instead by tapping on Use Template. Go through the template photos 3 times. You will arrive at the patient's procedure details window. Here, tap on the Add 90 button at the top of your screen to add in 2 more photos to your procedure if you need to. Once you have put those 2 photos in, you will notice that you can now flip between the 45 and 90-degree viewing angle. Now that you have your photos, let's go ahead and log some products on them. Tap on Add Product Injection and your inventory will pop up. This will be a direct reflection of what your inventory looks like. That's why it's important to set up your product listing and pricing prior to this. Select a product from the listing and depending on the amount of product you're applying per injection, change the product's unit on the right too. Now, double tap on the face in the photo to indicate where you were applying the treatment. If you are applying more than one product, you can tap on the + button again and select another product. Using the Draw button on the left, you can change the coloring and shape of this new product to differentiate it from the first product. 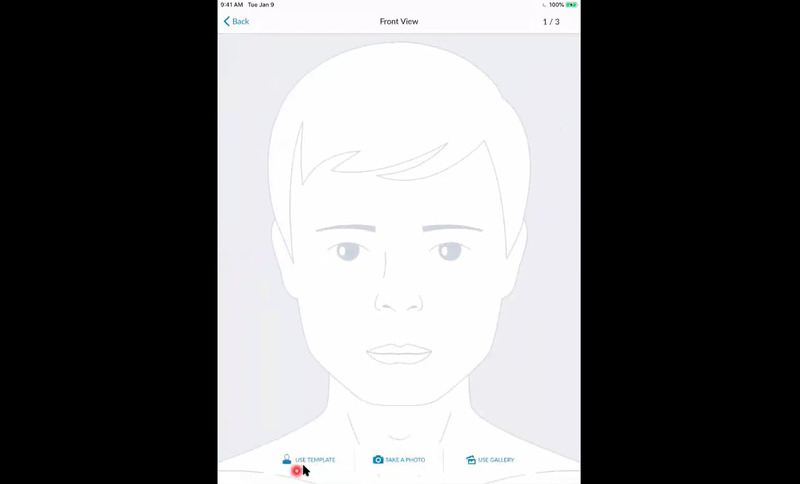 Tap on Draw and choose the appropriate shape and coloring, then apply it on the face again. Continue to apply products to this procedure as you wish. Once you are done with the procedure, tap on the floppy disk icon in the top-right corner to save it. Now, let's head over to the Treatment Summary tab. You will find the products that you used here. Tap on + Traceability to add traceability information to your procedure. Aesthetic Record will automatically pull information from your inventory and allow you to pick batches of product that you have stock for. Specify the Batch ID of your product and the number of units that were used in the drop-down menus here and tap Add. Once you have added your traceability information in, the units that were used for this treatment will be automatically deducted from your inventory. Now let's go all the way back to your patient's Cosmetic Timeline. You will notice that there's a new procedure on this timeline - the one that you have just added. Navigate to the procedure and tap on Add Notes to add a note to the procedure. The note can be about anything related to the treatment that you want to keep on record. With the procedure added, you can also take your client's payment by tapping on the Take Payment button. 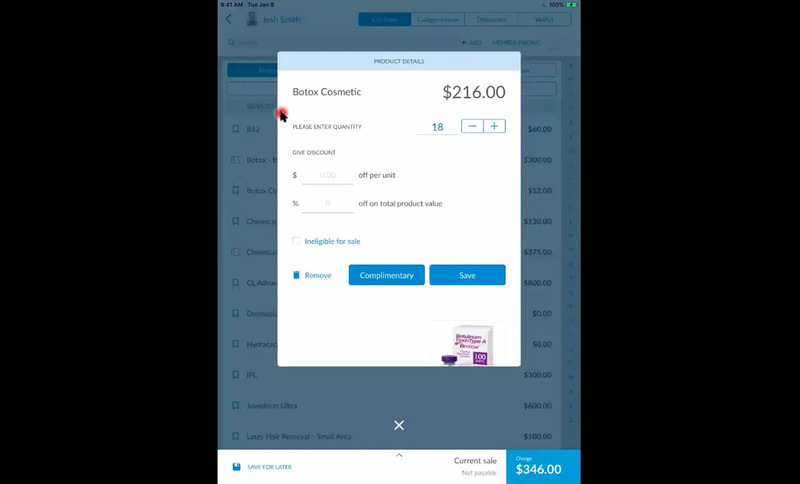 At the bottom of the screen, you can maximize your client's cart. Everything that you logged in the treatment summary will be automatically sent here to compute the sale. If you need to apply a discount, tap on the product and enter the relevant discount on the Product Details window. Similarly, if you need to delete an item from the customer's cart, click on the minus sign on the right of the cart. 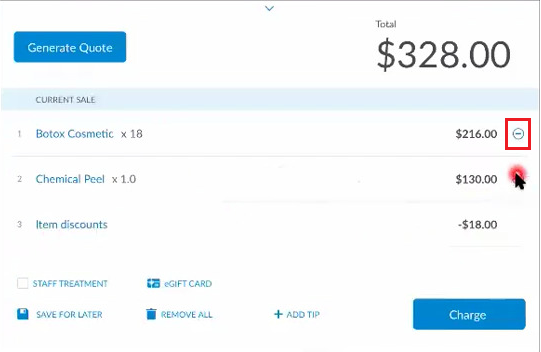 Hit the Charge button in the bottom right corner and follow the prompts there to finalize your transaction.